So after seeing all the leaks about mobile devices and OS’ we shall turn our attention back to the Patent-wars. Well no this time we are not reporting about one company suing another, but instead in an interesting development Google has filed for a patent with the USPTO for Slide-to-unlock. 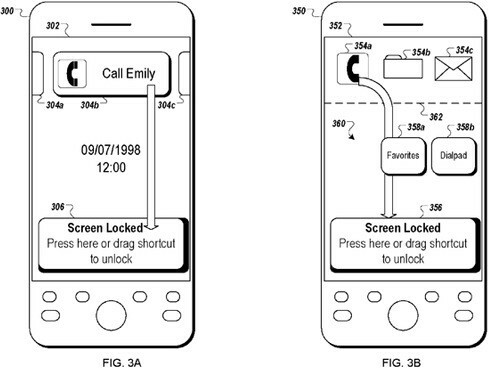 Well now you may be wondering that the Slide-to-unlock patent rest with Apple and so how can Google apple for it? Well it seems that Google has developed a vertical unlock system. The patent in question is called “Input to Locked Computing Device,” which is Google’s way of dealing with Apple’s Slide-to-unlock and also save itself from Apple’s legal team. Apple has lately been attacking Samsung saying that it violated its device unlocking patent. From the diagram we can see the type of unlock system that Google has made. Here you can drag icons and jump straight to the chosen application, or even executing shortcuts like directly calling a specific contact or sending them an SMS. Perhaps this vertical unlocking mechanism, which is coupled with the function unlocking mechanism, will be recognized as totally different and save an attack from Apple. Also with news popping in the Google is already working on the next Android, Jelly Bean, we could see this unlocking system in the next upgrade. BlackBerry Playbook 2.0 coming at MWC?